Didn't get what you wanted for Christmas? Post holiday sale for a scroll anywhere in the US for $45.00. (Includes shipping and taxes). The caveat, I will choose the cloth. 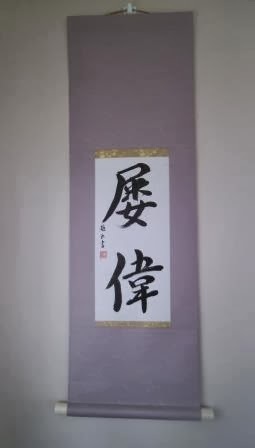 Size is approximately 2 feet long by 10 inches wide....contact sales@customjapanesecalligraphy.com for details. This scroll was commissioned for an Aikidou trainer in the Southern US. 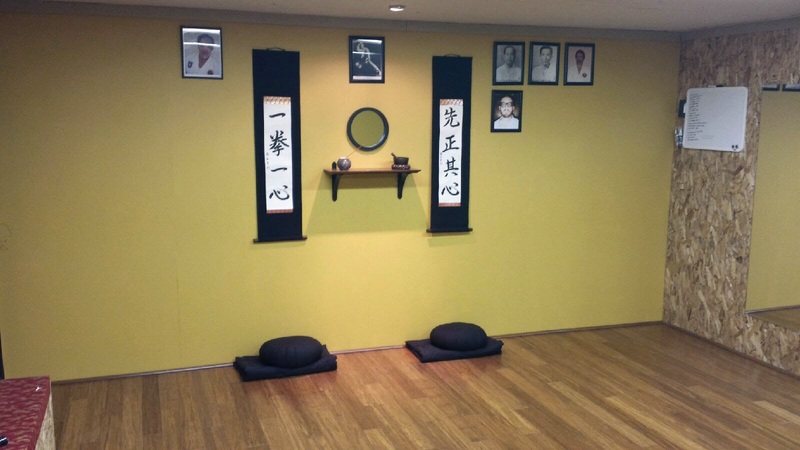 It says in English, Through the virtue of humble training, understanding of Aiki is acquired naturally. 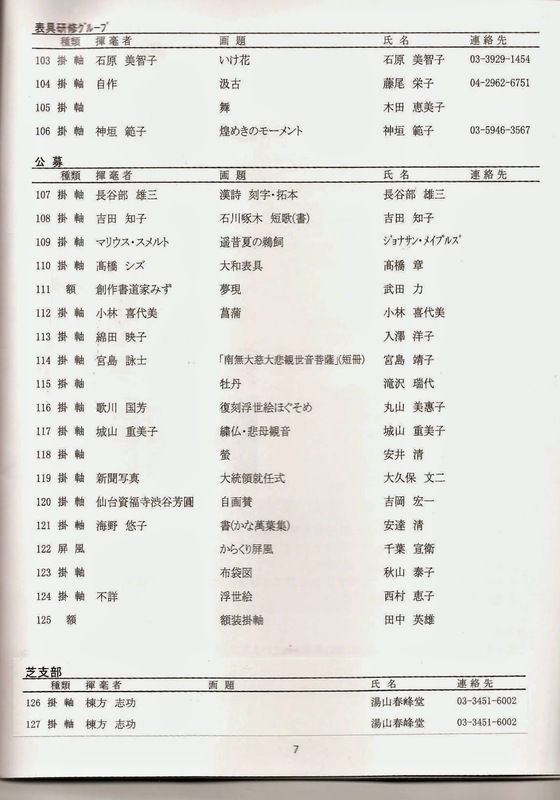 Just for informations sake, there were 4 iterations provided by Mr. Akamatsu. Then my wife took the translations, and melded them into syllabic form that would work for calligraphy and the lines provided. 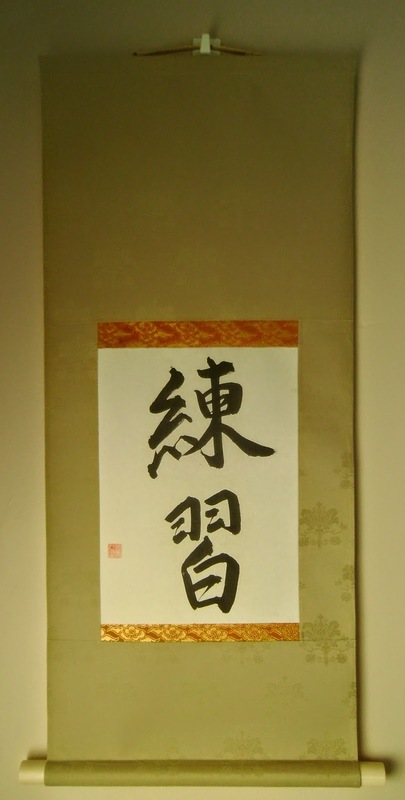 It is written in the Gyousho, semi-cursive style by Ryugyoku Yamada. 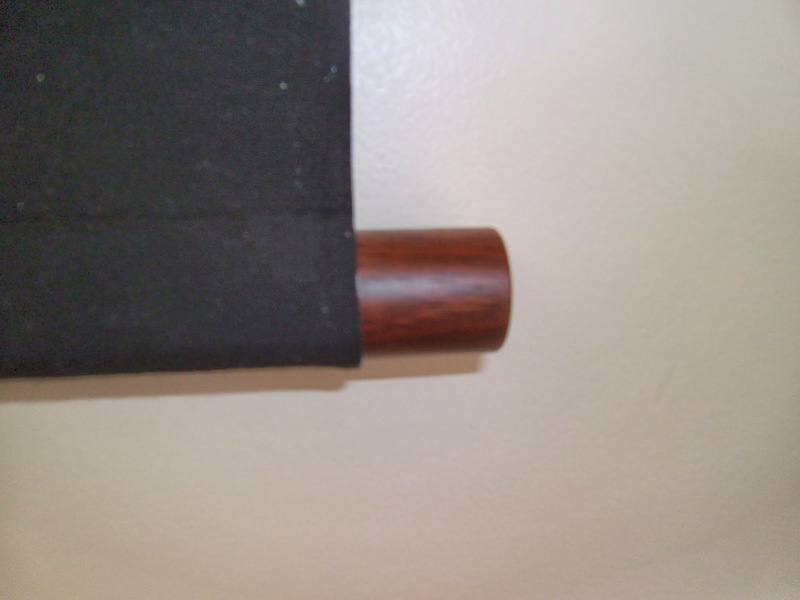 The scroll was made by myself, it is a three step style scroll called sandan hyougu. The ichimonji is a a wave pattern with gold and silver. The chuumawashi, intermediate cloth is a burnt orange, with large ivy karakusa (arabesque) pattern. This cloth is a pure silk (Shouken) The Ten/Chi is a dried reed color shike silk. 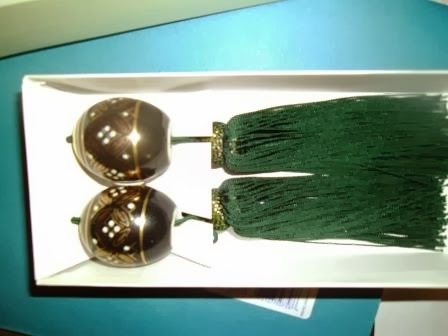 It is completed with a jikusaki that has a red lacquer, and machined edge, and the hanging string is a light green with gold (kinka). This scroll is for a European martial artist. He brought to my attention a new Japanese word that I was wikipedia in Japanese. 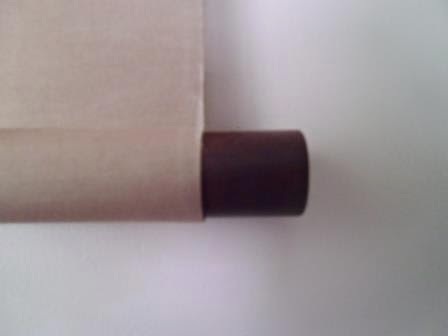 The scroll is Hanshi size with a black kireji. The red ichimonji was to help create a strong visual barrier between the writing and the cloth. It is written in the Gyousho (Semi-cursive) style by my wife Ryugyoku (Yoshimi Yamada Maples). It is finished with a Shitan (Rosewood) jikusaki and a Kon (navy) kakehimo or hanging string. 屏風 Byoubu is another common product made by Hyousoushi. My Sensei called me only a Hyougushi up to this point, but if I can learn to make other products as nicely as the scrolls, then I hope that I can be an overall Hyousoushi. In Japan, you can purchase the Kamachi (inner frame) that is already premanufactured. But here I have to make all the measurements and cuts myself. 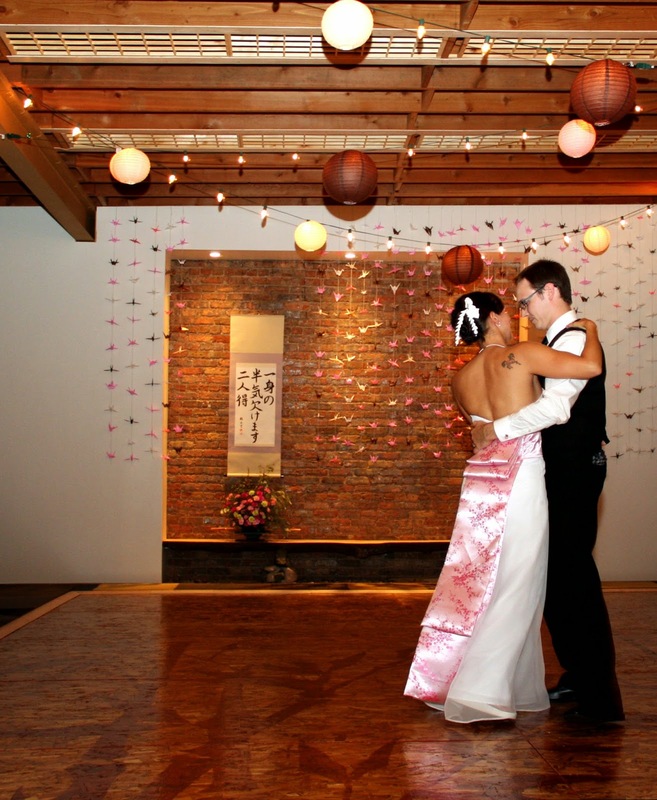 I then followed the directions that my Sensei taught to me. I put the final paper on over a year ago, but had not finished the wood trim. I finally decided on staining the wood cherry, and did that a couple of months back. Finally tonight I made the cuts and finished the framing. Bonsai Artist friends! Do one of these scrolls look familiar? A bonsai artist came to me and asked for help to develop his idea to display his bonsai. He wanted a distant mountain or cliff in a painting to use with his Rocky Mountain Juniper. So I scoured for photos of actual scenes in the Rocky Mountains. I knew his tree would be placed on the left, because of its natural flow to the right. In Japanese this is 左勝って右流れ (hidari Katte, Migi Nagare). So I was looking specifically for a cliff or mountain that continued and complimented the flow to the right to coincide with the movement of the bonsai. It also clued me off to where the Hanko or artist stamp should be placed. I finally found a photo of a locale in New Mexico, and checked if this would be correct geographically for a Rocky Mountain Juniper, and aha, I found it. This was then sent to Mariusz Szmerdt to make the painting. 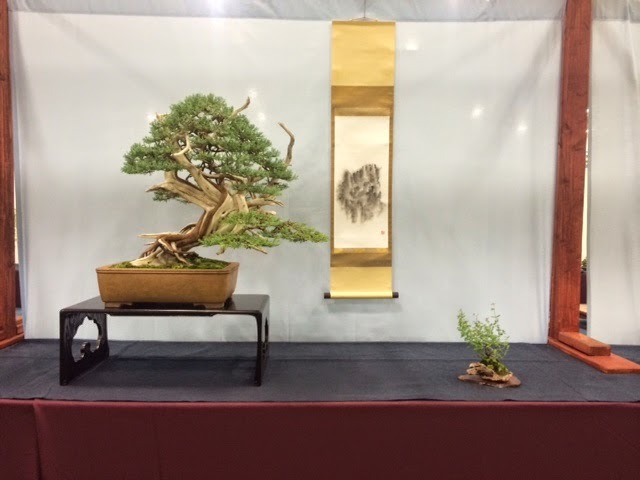 I know his skills as a Sumi artist, and he could have made every crack and crag with such precision and detail, but that would have detracted from the display because a detailed painting competes with the bonsai in many cases. I wanted this wallscroll to be a truly supporting actor role in the display. The first two iterations were good, but I thought that they might be too small, to work with this particular tree. I asked him to do one last version slightly larger with a little more detail. He then shipped the final three versions. I also requested that the bonsai artist provide me with detailed information on the dimensions of the display space and the colors of the backgrounds that would be used. This was vital for me to try and get the size of the scrolls just right and select appropriate cloth colors/patterns that would sit well in the background. The most worrisome thing about this is that normally, I get a painting from this artist in about 2 weeks....but three weeks had passed away and still no painting. I called the USPS, the NY customs branch and finally had to call the Regional USPS office in order to get this painting here. It took me over four hours of time negotiating with the USPS to get the painting here on time. As soon as it came, I started making the scrolls. 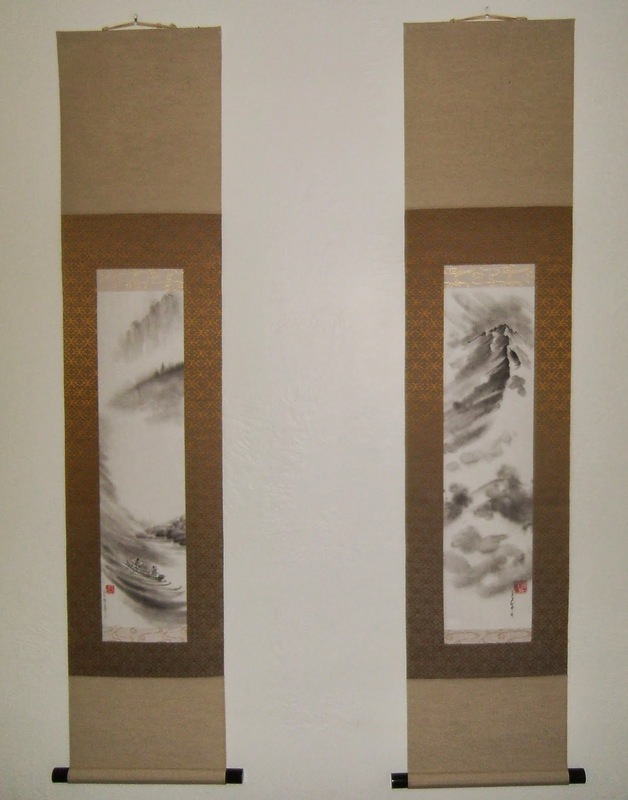 I made the scrolls based upon the formality of the species and styles of the bonsai, as well as how a specific style would bring out the feel of each painting. The less detailed and smaller version painting, I decided to go with a less formal scroll style called Maru Hyougu. 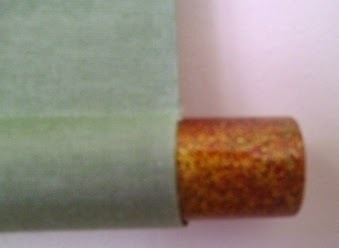 I used a solid Benberugu cloth that is rust sand color, with a gold on white Ichimonji. I used a Light Gold Hanging string and a rosewood jikusaki. For the more detailed slightly larger cliff, I decided to put it in a three step style scroll. There was a slight green in the Ichimonji, with a brown on glold large arabesque design. The Chuumawashi is a Shiha cloth with a small arabesque to offset the larger design in the Ichimonji. The Ten/Chi is a Benberugu cloth with a dry reed/khaki color. It was finished with a light gold hanging string and a Chanuri (Brown Lacquer) jikusaki. Now do you know where you have seen this scroll? 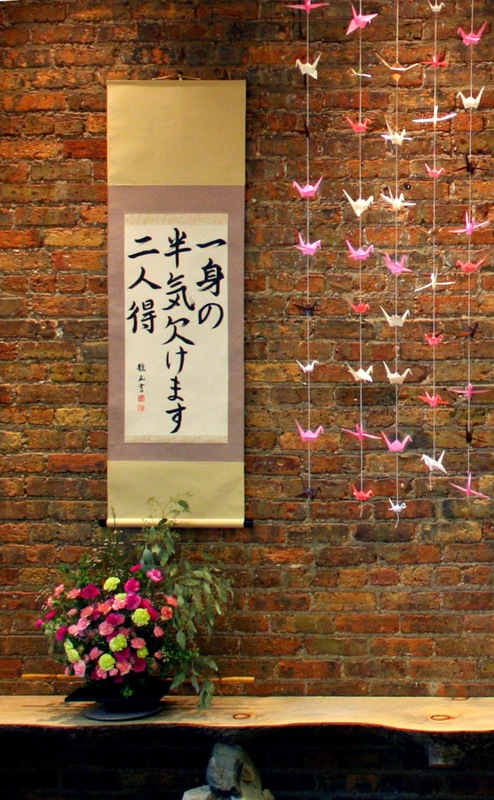 in a formal alcove with a bouquet, surrounded by origami cranes. May this man ever be blessed in his love. I have often been asked by many people, "How long before I get my scroll?" The reply I give is depends. Do you want a machine made production line scroll, like those pictured at the left...Or do you want a carefully thought and planned handmade scroll. The best scrolls made by hand spend years curing on the drying board. Several advantages to handmade scrolls are the fact that with the new production line techniques, the skills of restoration have not caught up. If you want a museum grade work, that can be restored without damage in the future, a kakejiku, or wallscroll needs to be made by hand. I make all of my wallscrolls and byoubu by hand. 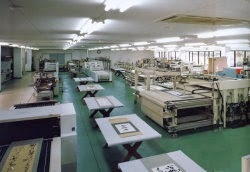 It allows for some creative processes that just can not be accomplished with a machine made wallscroll. The funniest thing, is when a bonsai artist or Martial Artist tells me I am not fast enough and they need to go with another option. I just state, can you have a finished bonsai or black belt in a day, week or month? It is the same with my work, time is the indicator of my quality. This was painted by Mariusz Szmerdt for a fall display that will be upcoming this year. I really took a long time on this scroll, which made many aspects of it for the long run much better hanging. From order to finish this took over a half year, and I am very glad for the patience of this bonsai artist. There is a lot of white space in the painting, and the geese are small silhouettes. This type of painting makes it easy for the tree to become the focal point of the display and the scroll to just complement the features. I chose this darker tan to help blend in with fall grasses that are very dry and dormant for the winter. The ichimonji is a small karakusa (arabesque) that is a gold on gold cream color. The kakehimo is the cloud pattern, which is gold with white fleck. The jikusaki is made with rosewood. Remember the painting I bought at auction of the Sagi 鷺 which is a heron or egret in Japan. This is the work I did today. First I cut away all the borders. I could have removed by applying water, but this was sufficient. Next I removed all the old backing paper called Urauchi from the painting. Lastly, I applied a new first layer of paper called Hada Urauchi to the painting. I hope you like how it is progressing. This is painted by Mariusz Szmerdt of Poland. He has such talent to do either abstract or very detailed painting. I wanted to do justice to the quality of the painting, so in this case I chose a black gold flower Karakusa (arabesque) that is a Pure silk for the Chumawashi (intermediate cloth). 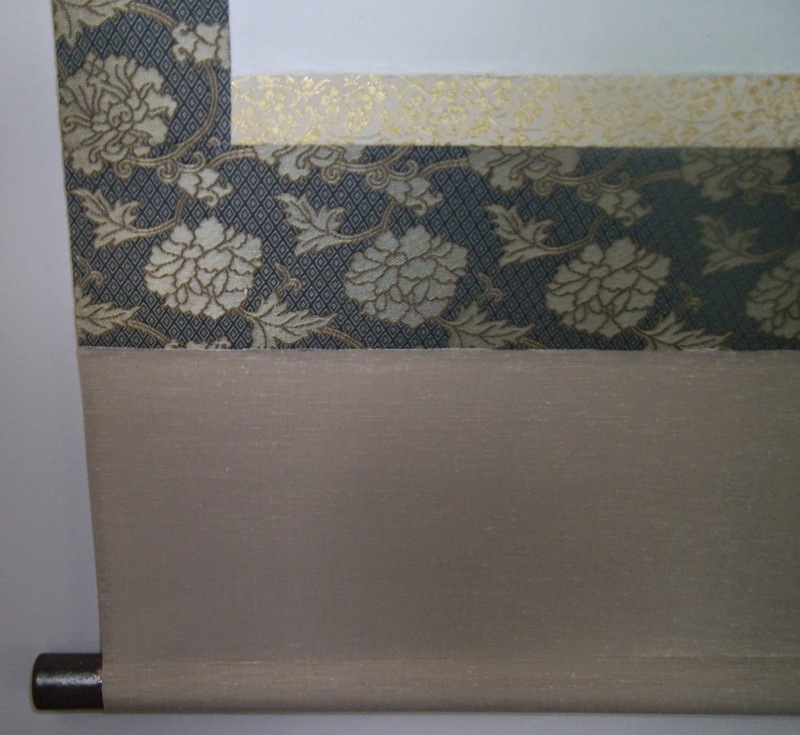 I chose a gold on gold with a small flower karakusa for the border to contrast with the black cloth, and for the Ten/Chi, I used a benberugu, shike cloth that is khaki/tan. It is completed with a Ceramic jikusaki that has a dark brown that creates a color symmetry with the black cloth. It is finished with a Gold (Kincha) hanging string.